It's been blazing hot here with local weather stations hitting record temperatures for June. Meanwhile, our fridge is full of excess milk that I'm too tired to turn into cheese. "Homemade ice cream?" Mom suggested. You don't have to ask me twice --- I'm sold! I added the cornstarch mixture to the warming chocolate mixture, then heated until just barely boiling to thicken my chocolate milk. After that, I removed the mixture from the heat and cooled it thoroughly in the refrigerator. Part two began three hours later when I froze the ice cream. I don't have any fancy equipment, but I do have ice cube trays, table salt, random cleaned out food containers, and a hammer. That appeared to be quite sufficient. 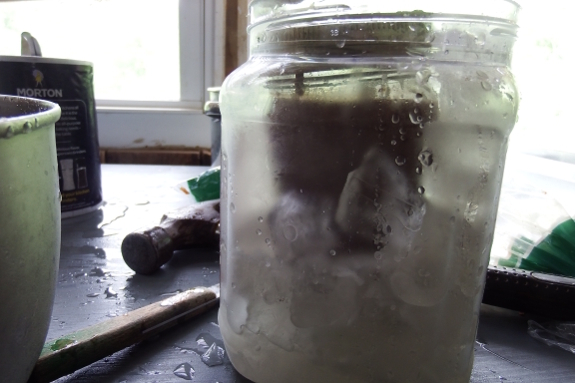 I crushed the ice cubes with the hammer, mixed in salt, and packed the frozen salt water around the small jar inside the larger container. Then I rocked the outer container with my foot (like a cradle) for about ten minutes, at which point I really should have added more ice. Since I was out of ice, I instead, stirred the halfway frozen ice cream and put it in the freezer. Another couple of stirs at hour intervals resulted in a delicious dessert that didn't seem to suffer from lack of cream and eggs. Yes, I'll definitely be trying this again with a larger batch soon. 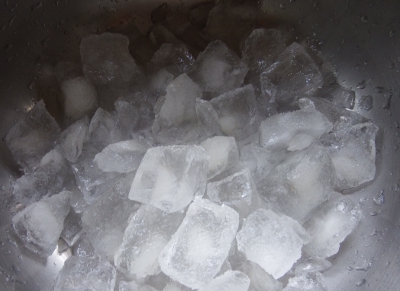 I think I'll freeze a tray of salted water next time, though --- after all, if I'm going to be whacking my ice with a hammer, I might as well get the colder cubes the easy way. We love to freeze our seasonal fruit, and then put it in the food processor with some milk and sometimes a bit of sugar. Whiz it up and it is like ice cream. 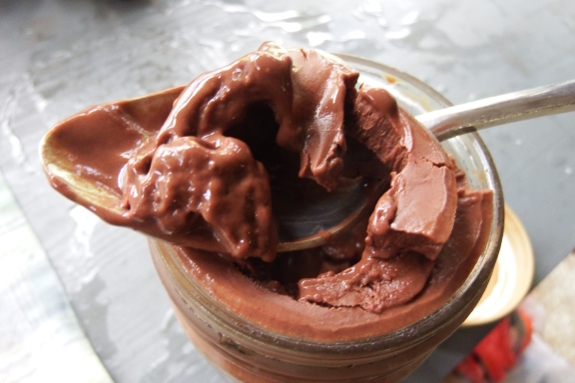 Put it in the freezer and stir it vigorously every 20 minutes and it becomes much more like ice cream. You should also try my favorite ice cream recipe: one cup milk, one cup cream, and whatever jam or jelly you want to get rid of. Peach is perfect! I also have a recipe for pumpkin pie ice cream if you're interested.